Background Evidence is mounting that first-pass complete recanalization during mechanical thrombectomy is associated with better clinical outcomes in patients presenting with an emergent large vessel occlusion. We hypothesize that aspiration achieving complete clot ingestion results in higher first-pass successful recanalization with quantitative reduction in distal emboli. Methods A patient-specific cerebrovascular replica was connected to a flow loop. Occlusion of the middle cerebral artery was achieved with clot analogs. Independent variables were the diameter of the aspiration catheter (0.054–0.088in) and aspiration pattern (static versus cyclical). Outcome measures were the first-pass rates of complete clot ingestion, the extent of recanalization, and the particle-size distribution of distal emboli. Results All aspiration catheters were successfully navigated to the occlusion. Complete clot ingestion during aspiration thrombectomy resulted in first-pass complete recanalization in every experiment, only achieved in 21% of experiments with partial ingestion (P<0.0001). Aspiration through the large bore 0.088in device resulted in the highest rates of complete clot ingestion (90%). Cyclical aspiration (18–29 inHg, 0.5 Hz) significantly increased the rate of complete clot ingestion (OR21 [1.6, 266]; P=0.04). In all experiments, complete clot ingestion resulted in fewer and smaller distal emboli. Conclusions Complete clot ingestion results in fewer distal emboli and the highest rates of first-pass complete recanalization. The rate of complete ingestion during aspiration thrombectomy is a function of both the inner diameter of the aspiration catheter and use of cyclical aspiration. Currently, thromboaspiration is conducted via continuous vacuum. Preliminary analysis of cyclic versus static aspiration patterns found that the varying pressure dynamics of cyclical aspiration proved more successful at clearing clots in an experimental model.13 Application of more complex aspiration profiles may increase the probability of attaining complete clot ingestion, which, in turn, may reduce the frequency of distal embolization. The objective of this study is to characterize distal emboli generated during various aspiration-based procedures in comparison with gold-standard SR thrombectomy with proximal flow control. Herein we test the hypothesis that enhanced clot ingestion during aspiration thrombectomy yields high rates of complete recanalization and reduction of distal emboli.14 We evaluate if large bore catheters and cyclical aspiration patterns can improve the extent of clot ingestion. A patient-specific silicone phantom of the complete circle of Willis (COW) was built by using a small-batch manufacturing process.15 The silicone replica was connected to a circulating flow loop which contained a peristaltic roller pump that continuously delivered an oscillatory flow of saline to simulate cerebrovascular flow. The flow loop was equipped with pressure transducers (Validyne Engineering, Northridge, CA) along with flow sensors (Transonic Systems Inc., Ithaca, NY) and adjustable clamps to control the pressure and flow distribution. Silicone tubing with an inner diameter of 4.0 mm and 4.3 mm was used for preparation of hard and soft clot, respectively. A clot segment of 1 cm was later injected into the COW model to form the middle cerebral artery (MCA) occlusion. The clot models were introduced into the internal carotid artery (ICA) of the model and carried with the flow yielding an MCA occlusion. Angiography was performed to confirm the occlusion, and the experiment randomized to the treatment group. We used a block randomization scheme across treatment allocation to reduce bias. Two operators were involved in the study. Five treatment groups were used to achieve recanalization according to the manufacturer’s instructions per use. Thromboaspiration was performed with catheters selected across a range of internal diameters: the 0.088in and 0.070in (Route 92 Medical, Inc., San Mateo, CA); and the 0.068in and 0.054in(Penumbra Inc., Alameda, CA). The gold-standard technique of an 8F BGC-assisted SR (Solitaire FR, Medtronic Neurovascular, Irvine CA) mechanical thrombectomy was used as the control. The 0.088in and 0.070in catheters (figure 1) have a flexible catheter segment mounted on a pusher wire that forms a seal with an 8F sheath allowing aspiration of the clot through the catheter extension via the proximal sheath. Due to the fundamental difference in catheter designs as well as the radioopacity of the clot models, the operators were not blind to the catheter or clot types. Continuous aspiration was applied during retrieval with the assistance of the Penumbra Max aspiration pump. The 0.088in and 0.070in catheters on a pusher wire that seal with a femoral sheath. An 8F BGC (Stryker Neurovascular, Fremont, CA) was placed at the cervical ICA and delivered the microcatheter (Prowler Select Plus, Cordis, Miami, FL) that was navigated over the wire to the distal end of the occlusion. The microcatheter was removed following deployment of the Solitaire FR device (4mm×40 mm). A waiting period of 2.5 min took place prior to the inflation of the balloon after which aspiration was applied through the BGC via vacuum pump at 29 inHg during clot retrieval. An 8F long shuttle sheath (Cook Medical, Bloomington, IN) was placed in the cervical ICA for delivery of the 0.088in device, whereas all other catheters were delivered through a 6F NeuronMax (Penumbra Inc.). The tip of the aspiration catheter was placed proximal to the occlusion over a microcatheter, followed by continuous aspiration for a 2.5-min waiting period. The procedure described above was replicated for each aspiration delivery system. With the 0.070in and 0.088in catheters, no wire was used to cross the clot since the navigation was facilitated by the tapering soft dilator that accompanies the catheter. The dilator was delivered along with the aspiration catheter as a unit and deployed directly to the face of the clot. Once the optimal position for retrieval was obtained, the dilator was then pulled back and aspiration was applied via pump at 29 inHg. One thrombectomy attempt was permitted for each experiment, after which particulates were immediately analyzed. Recanalization was categorized as: failed defined as occlusion of the M1 segment; partial defined as recanalization of the M1 segment with any retained clot (typically in one of the M2 segments); and full recanalization with no retained clot within the model. The extent of clot ingestion within each device was used as an indication of aspiration efficacy. Complete ingestion was defined as full capture of the clot within the catheter under vacuum, whereas in a case of partial ingestion, the clot was corked, leaving a segment of clot visible outside the distal end of the aspiration catheter. Initially, five experiments were carried out per clot type (n=5 for soft, n=5 for hard) for each treatment group in an exploratory study. The two techniques demonstrating the best results in terms of optimal recanalization from the exploratory study were further tested with additional five runs per clot type, resulting in a total of 10 replicate experiments in a confirmatory study. Cases of failed recanalization were excluded from particulate analysis. Particle collection began directly after device deployment and ended after clot retrieval. Prior to clot injection for each run, 500 mL of saline was collected to serve as a baseline for particle counting. Clot fragments generated during the procedure were collected in two reservoirs, one for emboli distribution to the MCA and the other for emboli distribution to the ACA. Visible clot particulate found in the reservoir (>1000 µm) were manually removed and measured for length with calipers. The Coulter Principle was used to characterize particulate<1000 µm with two different aperture diameters; 400 µm and 2000 µm used to characterize small emboli between the size range of 30–200 µm and large emboli between the size range of 200–1000 µm, respectively. To further assess if cyclical aspiration patterns can improve the extent of clot ingestion, a SOFIA Plus catheter (MicroVention Inc., Aliso Viejo, CA) was navigated proximal to the soft clot in the aforementioned experimental model. Static (29 inHg) or cyclical (18–29 inHg, 0.5 Hz) aspiration was employed with the digital CLEAR Aspiration System (Insera Therapeutics, Sacramento, CA) and eight experiments per group were conducted. Distal emboli were further analyzed as previously described, and length of clot ingested by the catheter was measured in millimeters. Statistical analyses were performed with Prism software (GraphPad, San Diego, CA). A normality test was applied to assess the Gaussian distribution of data. Particle results were shown as mean±SD deviation. The medians of two independent groups, if non-normal distributions, were analyzed using the Mann–Whitney U test. Categorical variables were compared with a two-sided Fisher’s exact test. Significance was concluded when P<0.05. Each device was successfully deployed to the M1 segment of the vascular replica in all experiments. figure 2 demonstrates that a higher recanalization rate was found with the use of the large bore, 0.088in catheter, regardless of clot type. Overall, a higher successful recanalization rate was noted with the use of the soft clot in each device group. Both the SR thrombectomy and 088in thromboaspiration techniques were comparable and effective for hard clot removal with a 90% recanalization rate (including both full and partial recanalization) after a single pass. However, the hard clot model proved more challenging for the remaining devices, each with a first-pass recanalization rate of 20% or less (figure 2A). Analysis of the 0.088in catheter demonstrated that full recanalization was achieved for each run during soft clot retrieval at first attempt (figure 2B). The 0.054in device exhibited the highest failure rate in both groups with zero flow restoration obtained with hard clot and a 20% partial recanalization rate with soft clot. Complete first-pass recanalization was achieved in every case in which complete clot ingestion occurred and in 20% of cases with partial clot ingestion (P<0.0001). Clot ingestion was a function of catheter inner diameter (figure 2C, exponential function, (R2=0.994). Flow restoration after first-pass mechanical thrombectomy of hard clot (A) and soft clot (B). With hard clot, 0.088in and SR are comparable with recanalization rates of 90% (including partial and full recanalization), while the 0.054in is unsuccessful in every case. Overall, a higher recanalization rate (including partial and full recanalization) is noted in all soft clot groups (088, 070:100%; SR:82%, 068:80%; 054:20%). (C) Overall experimental results suggest that clot ingestion rate is a function of catheter diameter (exponential fit, dotted lines are the 95% CI, R2=0.994). The extent of clot ingestion and device engagement with the clot had an impact on the level of flow restoration. The largest bore catheter obtained complete clot ingestion during 18 out of 20 replicate experiments. An example of complete clot ingestion with the large bore catheter is seen in figure 3A–D, where the device is deployed directly to the face of the clot. The force and large contact area of the catheter tip ensure the immediate removal of the radiopaque soft clot and 100% flow restoration is noted. 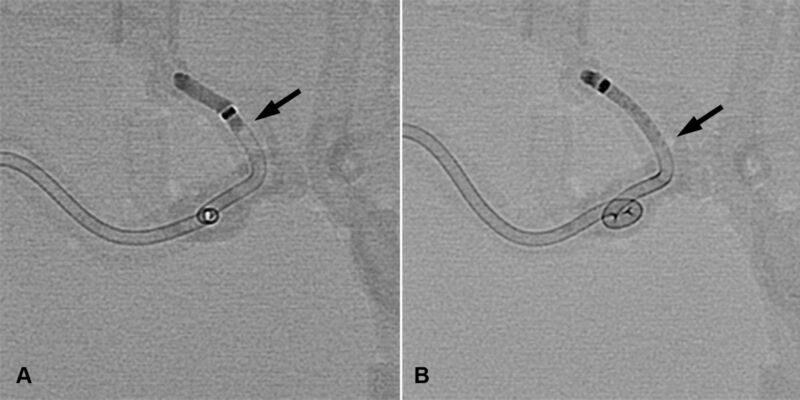 figure 3E–H shows the disruption of the soft clot with use of the stent-retriever, however, with anterograde flow blocked by the inflated balloon, the device was able to successfully capture and pull back the clot fragments. The 0.088in device is able to capture the soft clot, attaining complete ingestion and full recanalization with a single pass (figure 3A–D). Aspiration is started within 5 mm proximal to the clot (A) and the device is slowly advanced toward the occlusion (B). As the device approaches, there is impact loading of the clot toward the catheter (C) with complete ingestion and en bloc clot removal (D). 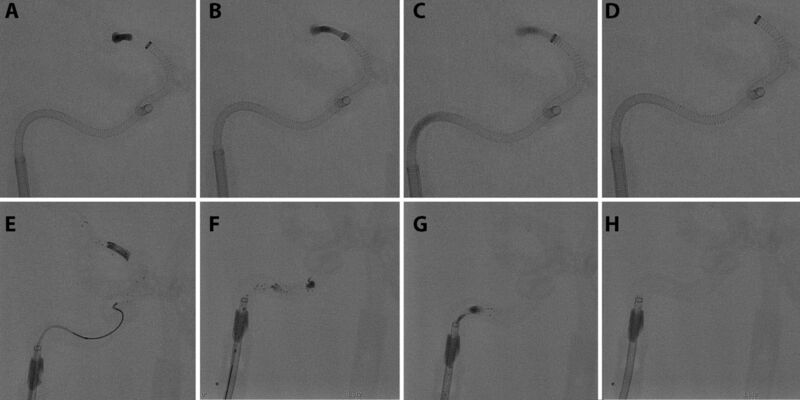 BGC-assisted stent-retriever thrombectomy is demonstrated in figure 3E–H. The stent is deployed (E), but during retrieval the clot is fragmented into multiple pieces (F) that are retained along the stent. The balloon is inflated arresting afferent flow (G) and the stripped fragments from the stent entering the proximal catheter are captured with aspiration through the balloon-guide catheter (H). Temporary blockage of ICA flow as a result of balloon inflation facilitates successful clot removal. The highest rates of complete clot ingestion with both hard and soft clot types were demonstrated by the 0.088in aspiration catheter (figure 4). The smaller 0.054in catheter failed to retrieve all hard clots and was only able to partially capture the soft clot in one experiment. The ingestion rates of each aspiration catheter illustrate the high percentage of complete ingestion achieved by the 0.088in catheter in both groups, hard clot (left) and soft clot right). A trend was observed across all particulate groups for the soft clot to generate a higher number of clot fragments versus hard clot (figure 5). In addition, visible emboli>1000 µm quantified from each run were typically found in the MCA distribution regardless of clot type, with only two cases where emboli emanated from the ACA (0.068in catheter and SR groups). In the confirmatory study of two leading techniques, the 088in catheter demonstrated the ability to significantly reduce soft clot fragments>1000 µm compared with the SR (P=0.0325, figure 5B). Average number of hard (A,C,E) and soft (B, D, F) emboli generated during the procedure. Distal emboli are classified into three different size categories, namely>1000 µm (A–B), 200–1000 µm (C–D), and 30–200 µm (E–F). Large emboli within the size range of 200–1000 µm were present in all groups and in similar quantities except the 0.054in aspiration catheter due to the low rate of recanalization. 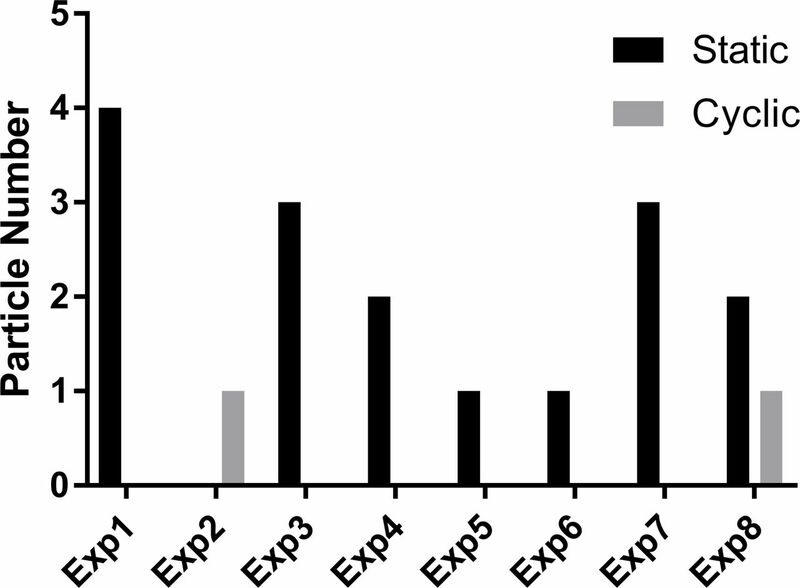 figure 5C shows a total of 24 hard clot fragments found from nine successful experiments in the SR group (average particle number per thrombectomy attempt: 2.7) and 15 hard clot fragments from nine successful experiments with the large bore 088 catheter (average particle number per thrombectomy attempt: 1.6). The average number of soft clot fragments generated within the 200–1000 µm size range were 4.2 and 2.9 for the SR and large bore catheter groups, respectively (figure 5D). Most clot fragments were in the 30–200 µm size range, regardless of clot type (figure 5E and F). In the cyclical aspiration group, 50% of thromboaspiration attempts yielded complete ingestion of the clot into the aspiration catheter, whereas complete ingestion was not observed using static aspiration. When the clot was partially ingested (corked at the catheter tip), there was a two-fold increase in the length of clot ingested with cyclical versus static aspiration (P=0.018) (figure 6). The ratio of clot found inside the catheter to the total length of clot was 29% for static and 50% for cyclical aspiration (P=0.02). Static aspiration leads to minimal clot ingestion (arrow, (A) whereas more clot is ingested into the catheter with cyclical aspiration (arrow, (B). Clot retrieval conducted with static aspiration resulted in a total of 10 particulates larger than 1000 µm compared with just two particles accumulated from the cyclic aspiration group over eight experiments. For particulate in the 200–1000 µm size range, six clot fragments were noted with the use of static aspiration while cyclic aspiration did not yield any. The rate of generating distal emboli larger than 200 µm was significantly higher for static than cyclical aspiration as a whole (OR21 [1.6, 266]; P=0.04) (figure 7). A similar pattern was exhibited in the 30–200 µm size range, where less clot particulate originated from cyclic aspiration. The rate of generating distal clot fragment larger than 200 µm was higher for static versus cyclical aspiration. Completion of this study confirms our hypothesis that complete clot ingestion via a large bore catheter or cyclical aspiration can achieve high rates of first-pass recanalization with minimal distal emboli. Specification of aspiration catheter has a great impact on the aspiration efficacy during thromboaspiration. The advantage of implementing an enhanced aspiration profile in the form of cyclic aspiration featured a superior level of clot ingestion into the aspiration catheter, thereby effectively reducing the rate of distal clot emboli. Previously, it was hypothesized that fatigue and fracture from dynamic loading explain improved recanalization due to cyclical aspiration13 however, we did not observe increased rates of clot fragmentation into the catheter during cyclical aspiration. Perhaps a more likely explanation is related to the viscoelastic behavior of the clot, where an oscillating pattern of aspiration allows an initial clot softening due to dynamic compression.26 Another potential explanation is that dynamic friction is generally less than static friction,27 the latter which occurs once the clot becomes lodged in the tip of the catheter (corked) and cannot be overcome by the static aspiration. Our study has limitations. To achieve our measurements, we use an in vitro model that does not capture the forces of the vessel-clot interface and phenomena such as vasospasm are not reproduced. Although this pre-clinical study confirms the deliverability of the 0.088in catheter, it should be noted that it has not yet been employed for patient use. Additionally, navigability of the large-bore aspiration catheter in the tortuous neurovasculature may be challenging in real-life AIS cases. Moreover, in order to preserve the clot structure we use isotonic saline solution as the working fluid that does not have the same fluid properties as blood. In a clinical setting, there may be additional clotting in the area of the occluded vessel due to flow stasis, which is not replicated in our experiment. Finally, distal emboli quantitation was only performed for cases in which full or partial recanalization was achieved, thereby reducing statistical power for devices in which low recanalization rates were realized. We demonstrated that complete clot ingestion during thromboaspiration is associated with high rates of first-pass recanalization and reduction in distal emboli. Both increasing the diameter of the aspiration catheter and using a cyclical aspiration pattern independently increase the rates and extent of clot ingestion. Contributors RA: designed and performed the experiments, analyzed the data, drafted the manuscript, and approved the final manuscript. MM: designed and performed the experiments, interpreted the data, revised the manuscript, approved the final manuscript. and agreed to be accountable for the accuracy and integrity of the work. JC: designed and performed the experiments, analyzed and interpreted the data, and approved the final manuscript. RMK: performed the experiments, revised the manuscript, and approved the final manuscript.CR: performed the experiments, revised the manuscript, and approved the final manuscript. ASP: designed the study, interpreted the data, revised the manuscript, and approved the final manuscript. MJG: designed the study, designed and performed the experiments, analyzed and interpreted the data, drafted the manuscript, approved the final manuscript, and agreed to be accountable for the accuracy and integrity of the work. J-YC: designed the study, designed and performed the experiments, analyzed and interpreted the data, revised the manuscript, approved the final manuscript, and agreed to be accountable for the accuracy and integrity of the work. Funding Partially supported by research funding from Route 92 Medical. The aspiration pump was generously provided by Insera Therapeutics. The content is solely the responsibility of the authors and does not reflect the opinions of Route 92 Medical or Insera Therapeutics. Competing interests MM, J-YC: Fee-for-service consulting for Stryker Neurovascular and InNeuroCo Inc. JC has received educational grants from Microvention/Terumo. and Medtronic Neurovascular and ASP: consultant for Medtronic Neurovascular and Stryker Neurovascular; research grants from Medtronic Neurovascular and Stryker Neurovascular. MJG: Has been a consultant on a fee-per-hour basis for Cerenovus, Imperative Care, MIVI Neurosciences, phenox, Route 92 Medical, Stryker Neurovascular; holds stock in Imperative Care and Neurogami; and has received research support from the National Institutes of Health (NIH), the United States – Israel Binational Science Foundation, Anaconda, Cerenovus, Cook Medical, Gentuity, Imperative Care, InNeuroCo, Magneto, Microvention, Medtronic Neurovascular, MIVI Neurosciences, Neuravi, Neurogami, Philips Healthcare, Rapid Medical, Route 92 Medical, Stryker Neurovascular, Syntheon, and the Wyss Institute. Data sharing statement All data presented in manuscript. Presented at This work has been presented in part at Society of NeuroInterventional Surgery 15th Annual Meeting (SNIS 2018), 2018 World Congress of Biomechanics, and Society of Vascular and Interventional Neurology Meeting (SVIN 2018).